The picture quality of these cartoons is in fact pretty good considering that they are all public domain, and that the film prints have been around for decades. They would certainly look better if they were released by their current owners, but since most of them have not, this is the only way to see them on DVD. Any original title sequences that reveal the logo of another company (WB, MGM, Paramount) edits or blacks out those logos. In the case of Blue-Ribbon Merrie Melodies and some other cartoons, a fake video title card is created. But it's not the picture that makes these discs losers, it's the audio quality. These cartoons were made around 60 years ago, when all films had mono sound. The people at WinStar who produced this disc felt that mono sound isn't good enough for a high-quality format like DVD, so they altered the sound for each cartoon into stereo surround sound. Normally this wouldn't be such a bad thing if the original soundtrack recordings were used; DVDs of old movies like Gone with the Wind have been remixed for surround sound and they sound pretty good. But because these cartoons are public domain, the original soundtrack recordings are not available. The people at WinStar took the original mono sound and ran it through various devices which created a fake surround sound. They then recorded new sound effects and placed them into this fake sound mix, covering up the original sound effects. The new effects sound terribly fake compared to the original sounds, and the entire soundtrack often sounds as if it's emanating from a deep cave. Simply put, this modification of the original soundtrack is hideous. But it wouldn't even bother me so much if they had only included the original mono soundtrack as an alternate audio channel, which they obviously couldn't be bothered to do. 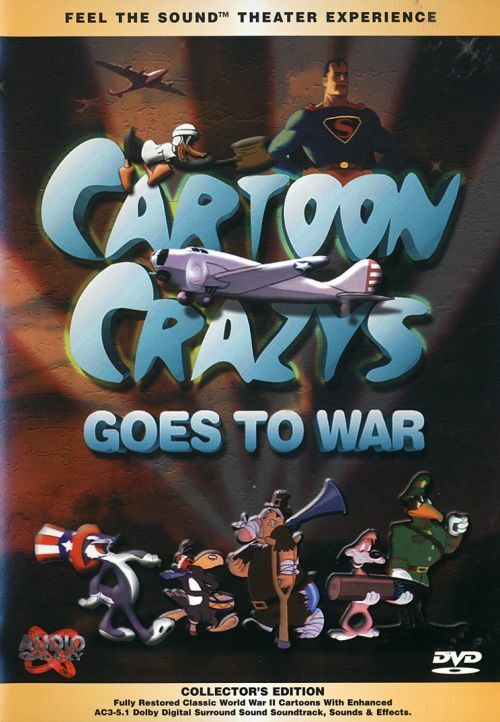 Each "Cartoon Crazys" DVD includes a preview of other volumes in the series, and a laughable "Cartoon Restoration Demo" that makes it look like they actually put some effort into making these cartoons look better. In reality they seem to be comparing the decent prints that they used on the disc to ugly, faded prints that other companies use for public domain compilations. Also included is a "Feel the Sound" demonstration, which helps to show just how awful the soundtrack mutilation really is. Most volumes also include a summary and a history of each cartoon. 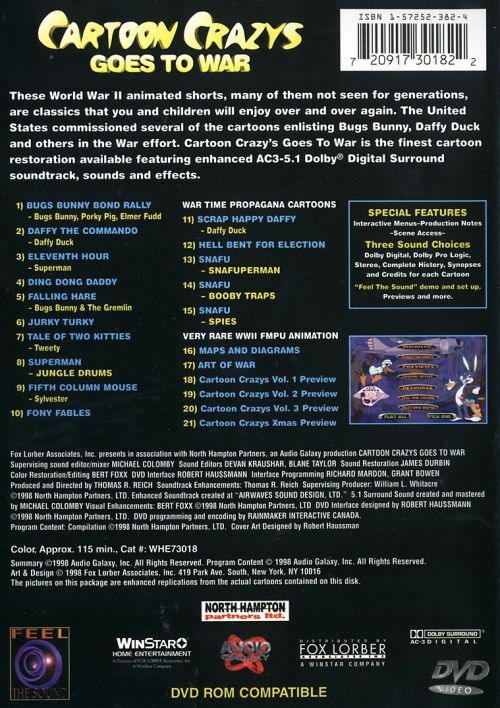 The only reason anyone would want to own a "Cartoon Crazys" disc is if they are desperate to see some of these cartoons on DVD, or if there are certain cartoons on the disc that they have never seen before and cannot be found anywhere else. Otherwise, I strongly suggest that you avoid these discs and wait for someone else to release them on DVD with a little more respect. There are two reasons I'm giving this Cartoon Crazys volume two stars: "Scrap Happy Daffy" and "Hell-Bent for Election". These are two excellent wartime cartoons that no cartoon collection should be without. 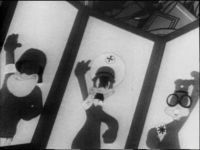 In "Scrap Happy Daffy", Daffy Duck must contend with a Nazi goat sent by Hitler himself! "Hell-Bent for Election" is a fascinating propaganda cartoon urging people to re-elect FDR to his 4th term as president. This was the first cartoon by UPA, and was directed by Chuck Jones. 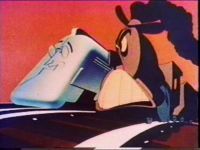 The "Bugs Bunny Bond Rally" is also interesting; it's basically a one-minute trailer asking you to buy war bonds, in which Bugs Bunny sings in blackface. The other WB cartoons on this disc are better presented on a wonderful videotape called Bugs & Daffy: The Wartime Cartoons, which I urge to to check out. Superman and Private Snafu cartoons fill up the rest of the disc, both of which are better seen on their respective DVD collections. Though you'll hear the usual soundtrack mutilation on this collection, it is not as bad as it is on other Cartoon Crazys discs. 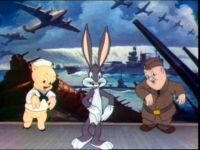 If you are really interested in wartime cartoons, get the Snafu DVD and look for that Bugs & Daffy video, and maybe take a glance at this DVD for some other rare gems.